The use of renewable energy sources such as wind energy for generation of electricity is not a new technology. In fact, it draws on the rediscovery of a centuries-old tradition of wind power technology. It’s now hard to tell how important a role wind power played in the past. Harnessing wind energy has become common in today’s society as we moved away from fossil fuels to more sustainable forms of energy, absolutely free from carbon dioxide production. Although energy can come from coal, oil and other resources, we have an abundance of wind and other natural resources that do not result in pollution. Renewable energy is clean and it comes from nature without polluting it. Windmills and wind turbines are two of the most prominent technologies that harness wind power and put it into practical use. Today, wind energy plays a significant role in the energy supply of the developed world. Wind power has been used since early times by mariners for sailing boats n rivers and lakes. The wind power technology has been reinvented many times in human history and over time, become one of the leading mechanically based renewable energy sources. Wind turbines are still a reliable and cost-effective technology used to generate electricity without even generating harmful gases. Today, windmills are also referred to as wind turbines, but are technically different in terms of operating principle. Windmills are one of the first and most effective man-made means of power generation that harness the power of wind and use it for a number of functions such as pumping water, saw-milling timber, grinding grain, and so on. Windmills have been around for as long as humans existed on earth. They are carefully engineered turbines that make the most of the wind energy to generate power. Windmills are still used on farms for pumping water and other farmhouse needs. Wind turbine is a mechanical device that uses the kinetic energy of the wind to generate electricity mostly for commercial applications. The wind turbine technology is one of the most cost-effective and reliable technologies used to generate large amounts of electricity. It is a great source of clean energy which uses wind energy without generating harmful gases. It is widely used to generate electricity for homes and commercial areas. 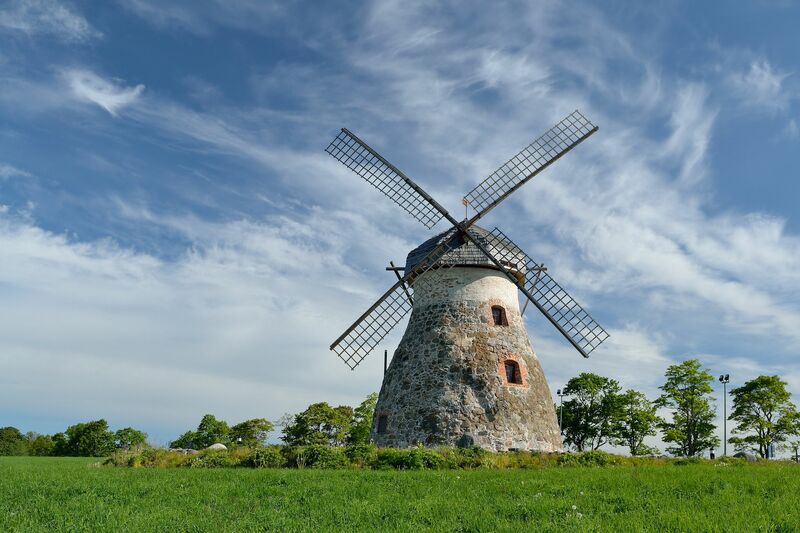 The terms windmill primarily refers to a wind-powered machine that converts the energy of wind to pump water or grind or mill grains such as wheat or corn and turn them into flour for bread making. It harnesses the power of wind directly and converts it into mechanical energy by means of vanes called sails or blades. Wind turbine is a mechanical device that converts the kinetic energy of wind to generate large amounts of electricity without generating harmful gases. Wind turbine technology is one of the most effective and low-cost sources of renewable energy that use wind power to generate electricity for distribution. Wind turbines work on a simple principle. It usually consists of two to three large propeller-like blades which turn around a rotor when the wind blows and the rotor is connected to the main shaft. When the wind blows, the blades of the turbine start to spin which in turn drives an electrical generator to generate electricity. Windmills contain enormous blades which move in a circular motion when wind blows against those blades which in turn spin a shaft. The shaft then prompts a generator which is connected to the blades to generate electricity. The blades of a wind turbine operate on the principle of lift and drag. They exploit the aerodynamic forces which generate when the wind blows against the blades and the blades then move relative to the wind. Just like aeroplane wings, the blades on the wind turbine generate lift due to the curved shape of the blades. As wind passes over the aerofoil, a low air pressure generates on the side with most curve while the high pressure air is pushed to the side of the aerofoil. In windmills, a pressure difference is created over the different regions when the wind blows over the blades causing the blades to rotate. Windmills convert the energy of wind into rotational energy which is mainly used for water pumping. However, they are commercially used for electricity generation. They work efficiently in worst of the environmental conditions and extreme temperatures. From pumping water to crushing to shredding rocks and agricultural material, windmills serve a wide range of purposes based on applications. Wind turbines are commercially used to generate electricity to power homes, schools, or businesses. Even local government and municipalities benefit from the commercial scale wind power. 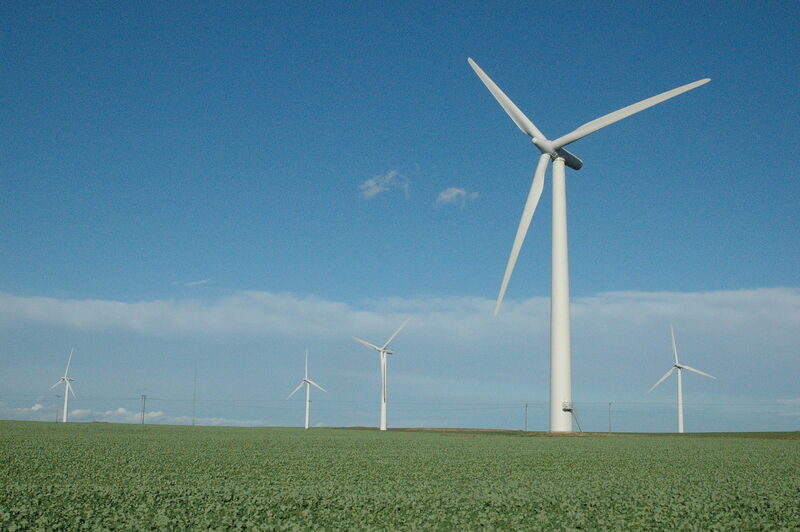 Wind energy plays a significant role in the energy supply of the developed world and is a renewable source of energy. This source of energy is produced using wind turbines and windmills. Both harness the power of wind to produce electricity, but they differ in the way they do it. Although both the terms can be used interchangeably, they are quite different in terms of working principle and operating. Windmills are a wind-powered device that converts the energy of wind by means of vanes into mechanical energy. Wind turbines convert the kinetic energy of wind to generate large amounts of electricity to power homes. Sagar Khillar. "Difference Between Windmill and Wind Turbine." DifferenceBetween.net. 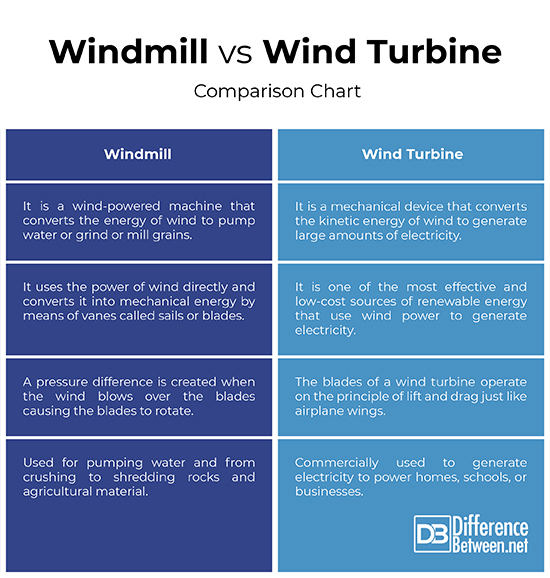 October 4, 2018 < http://www.differencebetween.net/technology/difference-between-windmill-and-wind-turbine/ >.